"Robbing Peter to Pay Paul"
From the very beginning of his artistic career Dempsey Essick has drawn his inspiration from the land and the people he has grown up with and loves. His love of things hand crafted is reflected in his latest painting which features a patchwork quilt which is made in an old pattern called "Robbing Peter to Pay Paul." The design dates back many years and is expressed beautifully by the mother/daughter team of Ruby Craver Cook and Lou Ann Barker both of Welcome. It is always a joy to meet people who love and cherish the patch of earth where they were born and where their parents and grandparents going back many generations, were born and lived. These are the people who are sometimes called "The Salt of The Earth." They are the rock solid, God fearing, hard working, people who made our country what it is. Ruby Craver and Lou Ann Barker have their feet planted firmly in the soil of northern Davidson County, NC. Ruby is Lou Ann's mother. She is also a direct descendent of John Davidson Craver who was one of the earliest pioneers to settle in what is now Davidson County, North Carolina. Ruby worked the farm when she was small. She could do everything from tending the cows to making soap in a wash pot with hog grease and Red Devil Lye. Lou Ann grew up with an artistic flair that is invaluable when selecting fabrics, colors and patterns for one of the couple's many quilts. The two have made over 50 quilts the old fashioned way using homemade templates made from cereal boxes to cut out the hundreds of pieces and hand stitching with the quilt on a frame just like in the old days. 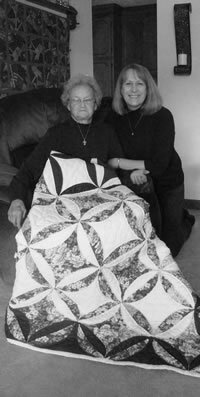 My mother (Ruby Craver Cook) and I have quilted together for twenty-five years. Some of our first quilts together were what are called “lap quilts”, this means that they were stitched on the quilters lap without using a frame. After finishing some “lap quilts” we began quilting with frames in my basement. We have made many precious memories together as we sit beside the wood stove in the winter, bonding and sharing stories. My mother and I have quilted over 50 quilts together. Mom was born in 1926, and grew up on a farm on Craver Road. Her parents (Manie & Oma Craver) raised her to be a loving and hard working woman. She grew up during the depression and the countless memories of her life stories would always amaze everyone in the family. Her mother was a quilter and the love for the craft was passed on. Grandmother loved embroidery and crocheting also [mom embroideries and I crochet] and like her we like to stay busy. My first quilt was started when I was 12 and finished when I was around 35. The quilt top was sewed on the sewing machine onto little pieces of paper that formed a star. Mom helped me and showed me this technique. 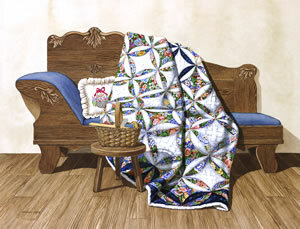 Of course being only 12 years old I lost interest in the quilt top and never thought about it till I was around 35. When I asked my mother about the quilt top she knew exactly where it was. She had placed the squares in one of my suitcases that was made for baby doll clothes. As I counted the squares I only had 19, so mom made the final square for me and we completed my first quilt. My first quilt is so special to me because it represents the love a mother has for her child, and also the love for her grown daughter. Our quilt frames were made by my brothers. They are made of pecan wood. My oldest brother, Ronnie Garrison, cut the frame out of lumber from a saw mill he was running at the time. My youngest brother, Freddie Cook, cut the holes in them. We had the frames for many years before we ever used them. My oldest brother is now deceased which makes the frames so special to mom and I knowing he made them for us. 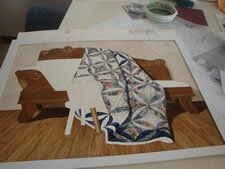 The quilt featured in the painting “Robbing Peter to Pay Paul” was completed about 10 years ago. The pattern came from one of my Mom’s countless quilt books. I cut the quilt top out of fabric and sewed it together. We quilted it together in my basement on our quilt frames. I cherish every quilt we made together, but most of all I cherish the time and memories made with my mother. For his painting, Dempsey has created a very simple setting reminiscent of a farm home of the 1930's. He has draped the "Robbing Peter to Pay Paul" quilt across an old wooden day-bed that belonged to his great-grandfather, Artis Walser of Reedy Creek, and added a milking stool with Lou Ann's sewing basket. The bare floors and simple surroundings are typical for a working farm in the days before central heat and electric lighting, days of hard physical labor and an abundance of warm family love. Dempsey has captured each fold in the fabric and depicts every shadow in the scene so faithfully that the viewer might be tempted to reach out and touch the quilt or stroke the surface of the daybed. It is a scene of such peace and tranquility that the viewer can imagine curling up on the daybed on a rainy afternoon and snuggling under the soft quilt for an afternoon nap. Pack okra firmly into hot jars, leaving 1/4 inch head space. Put a garlic clove and half pepper into each jar. Pour boiling brine to cover, leaving 1/4 head space. Process 10 minutes in a boiling water bath. Yield: about 4 to 5 pints. "The highlight of this project was getting to know Ruby and her daughter Lou Ann. Ruby," Dempsey shared. "I delighted in Ruby's many recollections especially about churning butter in the new electric washing machine. Lou not only quilts but loves canning and gardening. It was her gift of a jar of pickled okra that sealed the deal for me. These are two very creative women and the skill goes back even another generation since it's Ruby's mother's embroidered pillow top that is featured in the painting too." I had to use straight pins to secure a piece of paper and mark my place as I painted the quilt. The quilt pattern was very intricate as the same design was used in each square but faced different directions. As I studied the quilt I could see that Ruby and Lou Ann had taken great pains to make sure that each square was different but yet the same size. In retrospect I would still rather paint the quilt than to stitch it.